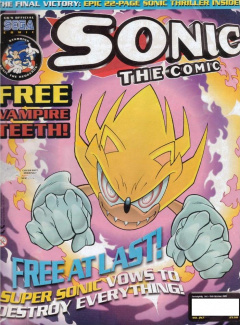 Sonic the Comic #217 is the two-hundred and seventeenth issue of the Sonic the Comic series by Fleetway Editions Ltd. This issue's contents were almost identical to Issue #100's, although with a different cover and fewer features. Graphic Zone: Fan art submitted by readers. The theme for this issue's Graphic Zone is "Portrait Gallery", featuring the cast of the comic going surfing. Owners of the printed art each won a Sonic the Hedgehog watch. This page was last edited on 18 March 2019, at 17:28.